About 1,000 properties have been flooded in a Northumberland town, and more than 100 people were rescued by boat from their homes. More than 400 people in Morpeth were moved to safety when the River Wansbeck burst its banks causing the worst flooding since the 1960s. 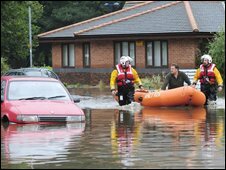 At its peak Morpeth High Street was under 2ft (0.6m) of water. Paul Hedley, of Northumberland Fire and Rescue Service, said: "It was a scene of utter devastation." Mr Hedley added: "The feedback I've had from my personnel who were working here was it was just something which they couldn't actually comprehend when they saw the scale of the absolute devastation. "And I have to say that it's testament to the tremendous dedication and commitment of, not just the fire and rescue service, but everybody who was connected to trying to mitigate the effects of this flood. " A major search was sparked when three experienced canoeists got into difficulty on the River Tees. Emergency services were alerted after three members of the party, aged 27, 19 and 15, got into difficulty in the water, which was swollen by recent heavy rain. A police helicopter was scrambled in the rescue when the three disappeared after taking to the water above Winston Bridge, near Barnard Castle, in County Durham. They were eventually found a mile downstream at Gainford village. Acting Sergeant Peter Moore from Durham Police said: "They were unable to cope with the river and were fortunate to escape unscathed." Morpeth resident Wilbur Roberts said: "It's been very very stressful indeed. It's just total chaos. "Everything in the house is damaged - television, three piece suite. "I cannot get in my kitchen because the freezer fell against the door, so I don't know how I'm going to get my medication." Three Northumbria Police officers who had originally been called to help some motorists cut off by a landslide 10 miles west of Alnwick became trapped themselves. The officers were on the A697 Powburn Road when a second landslide trapped them - they were rescued safe and well by RAF helicopter shortly before midnight. The chief executive of Northumberland Council, Steve Stewart, praised the town's residents for their "spirit". "We've had lots of voluntary effort. "We've had people offering spare bedrooms in the town, and we did actually put some people up at County Hall as well. "We're not ready to stand down just yet. I expect that won't be until tomorrow at least." Almost all roads in Rothbury were closed, and a pumping operation was under way in Brunton Park, Newcastle. Lustrum Beck, in Stockton, and Keswick campsite in Cumbria are also flooded. Three caravan parks in Northumberland have been badly affected at Budle Bay, Longframlington and Wooler. The River Wear is also in danger of bursting its banks in places. The town of Rothbury is almost cut off and several motorists are reported to have been caught out by the rising water. Many rural roads are closed in Northumberland and Durham. A large stretch of the A68 is closed between Corbridge and Colwell, and there are also problems on the A69 and A1.